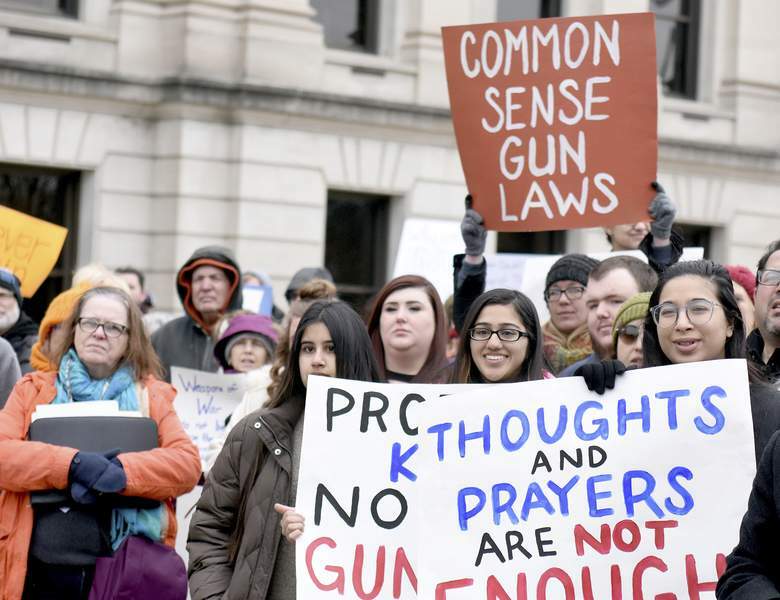 Rachel Von | The Journal Gazette A rally March 24 at the Allen County Courthouse Green was part of the nationwide March for Our Lives campaign, which advocated for gun regulations and safer schools. • Today's entry is the last in The Journal Gazette's look at school violence. Gun control activists who sought attention at public rallies last winter are seeking action in voting booths this fall. They say that Nov. 6, the day of the general election, is the most important date since Feb. 14, when 17 people were shot to death at a school in Parkland, Florida. “If the elected officials that are in office right now aren't going to do anything, we're going to make sure that we replace them with someone that will,” Brandon Blumenherst said. Blumenherst, 20, is a sophomore at Purdue University Fort Wayne, where he studies political science and communications. He organized a gun control rally in February at the Allen County Courthouse Green and assisted with another rally in March at the same site. Since then, he has helped register voters and managed the campaign of Kyle Miller, a Democratic candidate for an Indiana House seat. “After every mass shooting we see the same cycle: People are concerned, they rise up, they try to demand action from their legislators, and then they get nothing in return. It was a little bit different after Parkland,” said Blumenherst, a graduate of Homestead High School. “We're here. We want to be heard. And if we're not heard, then we'll try to replace you with someone who will listen to us,” Blumenherst said. It's a tall task. Republicans, who long have pressed for fewer restrictions on gun sales and possession, enjoy supermajorities in the Indiana House and Senate. The GOP also controls both houses of Congress, although by more narrow margins – just two votes in the Senate. In the meantime, gun violence has taken a back seat to a host of other issues heading into the presidential midterm election: immigration, health care, trade tariffs, the recent battle over a Supreme Court nomination and the constant chaos of the Trump administration at the federal level. For Indiana legislative races, the top issues have included public education funds, children's welfare, rural broadband access and prospects for legalizing medical marijuana and sports gambling in the Hoosier State. Blumenherst, who said he favors universal criminal background checks for gun buyers and wants assurances that customers' background information is being supplied to a national database, has a theory on why gun laws are getting so little attention ahead of the election. The Parkland-inspired March for Our Lives movement is led by young adults. Data compiled by Tufts University show only 19.9 percent of people ages 18 to 29 voted in the 2014 midterm election, down from 24 percent in the 2010 and 25.5 percent in 2006. Voting rates for people 65 and older ranged between 59.4 percent and 63.1 percent in those three midterm elections, according to the Census Bureau. In late September, March for Our Lives announced a voter registration and engagement campaign called #TurnoutTuesday. The organization planned a series of nationwide events, activities and promotions – including T-shirts, artwork and sidewalk chalk messages – designed to get more young people to the polls Nov. 6. The campaign is to culminate with a walkout from schools and workplaces at 10 a.m. on Election Day for mass voting. Paul Helmke, who was president of the Brady Campaign and the Brady Center to Prevent Gun Violence in Washington, D.C., from 2006 to 2011, said March for Our Lives activists seem to know what they are doing. “What the students figured out, and I think it's the right thing, is the reason you do marches and rallies and public demonstrations is to call attention to a problem and to basically let people know that there are others with the same way of thinking. Then they realize that something needs to happen next. And I think what most of them realized is it's putting pressure on those running for office at all levels,” said Helmke, a former three-term Republican mayor of Fort Wayne. “If this is something that leads young people to knock on doors, pass out literature for candidates, get to the polls, get their parents and their family and their friends to polls, I think it's going to make a difference, and it's going to translate into some action next year” on gun legislation, said Helmke, director of the Civic Leaders Center at Indiana University in Bloomington. Zoe Moore, an 18-year-old senior at Homestead, traces her anti-gun violence activism to middle school. She recalls lockdowns after reports of possible threats or dangers in the neighborhood of her school building in Fort Wayne. “I remember having to take cover and hearing over the announcements, 'This is not a drill,' and being under tables for over 20 minutes. … It made it more personal for me,” Moore said. She was a sophomore at Homestead when Blumenherst founded the Young Progressives Club at the high school. Moore is club president this year. She spoke at gun control rallies in Fort Wayne in February and April and attended the one in March. She organized a congressional letter-writing campaign among students and a voter registration drive at Homestead. Moore said she favors improvements in gun buyer background checks, a ban on bump stocks that speed the firing of semiautomatic rifles and an end to the gun show “loophole” that exempts unlicensed sellers from performing background checks on customers. Blumenherst said activists and their supporters “were kind of rallied out in a sense” after the Parkland shootings. “I think the next step is going straight to the home of a lot of these legislators in that we are going to the Statehouse,” he said. Fort Wayne attorney Martha Lemert, 51, leads the Fort Wayne chapter of Moms Demand Action for Gun Sense in America. She participated in student rallies after the Parkland shootings and has helped people contact legislators to push for changes in gun regulations. Lemert also is the Democratic candidate in Indiana House District 52. She is challenging third-term Republican Rep. Ben Smaltz of Auburn. Lemert said she has been affected by gun violence three times. When she was 16, her brother pointed a handgun at her and pulled the trigger – the gun went off but contained blank ammunition. “I learned from that that people do incredibly stupid things with guns,” Lemert said. She said a family member became a quadriplegic at 18 because of gun violence at a party. And a former colleague of hers was shot. Erica Jamison has three sons in school and reached out to Moms Demand Action after the Parkland shootings. Along with taking part in several rallies and protests, Jamison said she and members of the local group met with staff for U.S. Sen. Joe Donnelly, D-Ind., and she helped arrange a gun violence awareness program that focused on survivors. Moms Demand Action members meet monthly to “rack our brains as to how we can make a difference,” Jamison said. “I think we are getting the word out, but I think it's a slow process and it's going to be a matter of hard work,” she said. Jamison is disappointed that much of the conversation about school shootings centers on hardening school buildings instead of reducing the availability of guns. A report from several state agencies to Gov. Eric Holcomb included 18 recommendations on school safety, but none related to gun access. A bill filed at last winter's legislative session would have provided an exception to a ban on guns on school property for churches that have connected schools. Another proposal would have eliminated the $125 permit fee for a lifetime permit to carry a gun in public. The session's clock ran out on both measures as negotiators could not agree to final versions of the bills. In a May special session, lawmakers approved school safety legislation that provides an additional $5 million for a school safety grant program; requires a state audit of all school safety plans and allows schools to seek advances from the common school fund for safety capital costs; expands the definition of cyberbullying to include using cellphones or other wireless devices; and allows a teacher to barricade a door for three minutes when a fire alarm sounds before evacuating students if an active shooter has not been verified. “I don't think the only answer is to make our schools look more and more like cellblocks,” Lemert said. Since 2013, gun control advocacy groups have spent $10.5 million on federal lobbying efforts, according to the nonpartisan Center for Responsive Politics. In the same time, gun rights activists have spent $67 million on lobbying. During that period, gun-rights groups also have combined to contribute far more money to federal candidates than have gun control organizations – $12 million for the former and $4 million for the latter, according to the Center for Responsive Politics. But Every Town for Gun Safety Action Fund announced in September that it planned to spend $15 million on state and federal election campaigns in a dozen states. Giffords, a gun control political action committee started by former Arizona congresswoman Gabrielle Giffords, who survived a 2011 shooting, reportedly has spent $1.5 million on a single U.S. House race in Colorado. The Journal Gazette asked the staffs of three federal lawmakers who represent northeast Indiana – Democrat Donnelly, Republican Sen. Todd Young and Republican Rep. Jim Banks – for information on the number of phone calls, letters and emails they have received regarding school safety and gun violence since the Feb. 14 shootings in Parkland, and how those communications compare with other issues that the staffs hear about from constituents and interest groups. Helmke, who teaches an IU class about protests and dissent, said people who march and contact their representatives in Congress and at the Statehouse need to show their influence where it counts most. “If gun violence is the important issue to you, see where the candidates stand on that and vote accordingly,” he urged.